Nations Press feature news Must Read: Fear Of Friday The 13th-"Paraskevidekatriaphobia! Explained!! Must Read: Fear Of Friday The 13th-"Paraskevidekatriaphobia! Explained!! As any fan of superstitions will know, there is some bad karma surrounding any Friday that lands on the 13th day of the month. 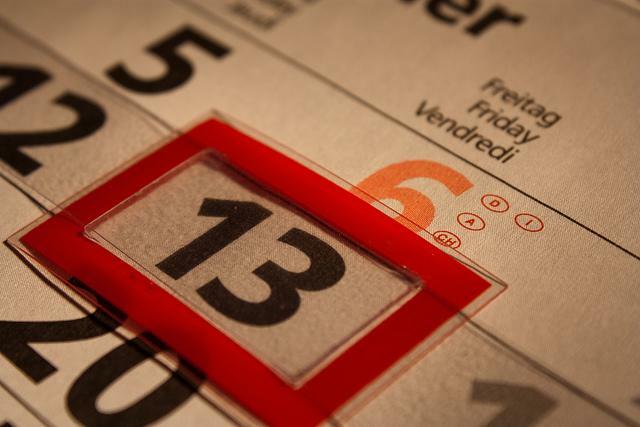 There’s even a name for the irrational fear of Friday the 13th: paraskevidekatriaphobia. The joke is that if you can pronounce the name, you’re cured of the phobia. Paraskevidekatriaphobia, is derived from Greek with the first half, paraskevi, relating to Friday, and dekatria relating to the number 13. Phobias are irrational fears of any activity, situation, or thing. It’s estimated six million people suffer from different phobias. Phobias can alter a person’s ability to function and enjoy life. Fear of Friday the 13th might have to do with the fear of the number 13, which has been called an unlucky number for hundreds of years. Some point to the number 12 for blame. The number 12 is a complete number and has various implications: There are 12 months in a year, 12 signs of the zodiac, 12 gods of Olympus, 12 labors of Hercules, 12 tribes of Israel, and 12 apostles of Jesus. As for Friday, some believe that because Christ was crucified on that day, it is unlucky, and some biblical scholars, according to National Geographic, believe that Eve was tempted by the forbidden fruit on Friday. These religious and number implications lead many people to do their best to avoid the date whenever it appears on the calendar. This leads to drops in business transactions, flights, hotel bookings, stock market buyings or sellings, and much more. This kind or any kind of phobia can be treated with desensitization therapy — exposing the person slowly to the thing they’re afraid of until they aren’t anymore — is used, but with Friday the 13th, that’s not really applicable. Instead, one might try cognitive behavioral therapy, which examines and changes thoughts and behaviors that contribute to the phobia symptoms.